Terri Stewart, director of the Office of Public Safety and Emergency Management at Ithaca College, addressed the Student Government Association Sept. 21. 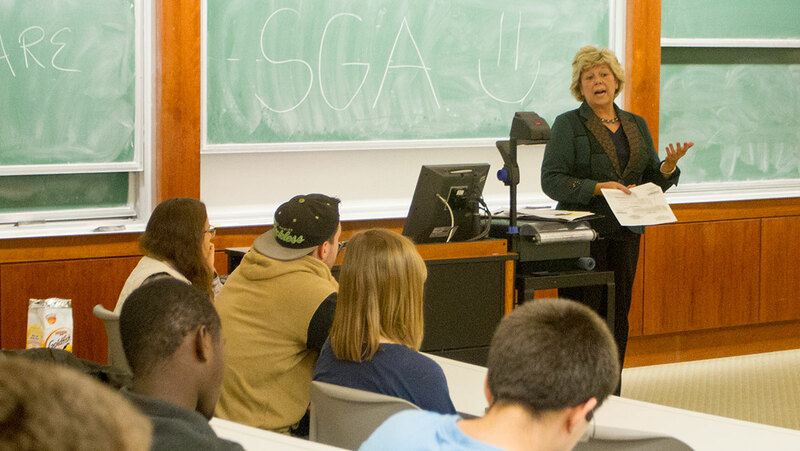 Terri Stewart, director of the Office of Public Safety and Emergency Management at Ithaca College, addressed the Student Government Association Sept. 21 and challenged the SGA to work with her office to continue a bill passed last semester by the SGA focused on holding Public Safety accountable. Stewart said the bill is currently sitting on her desk, and she needs a collaboration from the SGA to move it forward. She said there are aspects of redundancy in the legislation, as the bill calls for psychological evaluations of Public Safety officers, something Stewart said the Office of Public Safety already does. Senior Dominick Recckio, president of the SGA, said interested SGA members will meet with Stewart and present a more nuanced and researched bill to the SGA senate for approval. Sophomore Angela Pradhan, Class of 2018 senator; sophomore Joseph Fenning, School of Business senator; senior Kyle James, vice president of academic affairs; and sophomore Jonathan Couce, senator-at-large, agreed to work with Stewart on the bill. Stewart said she believes in engagement and accountability between Public Safety and the campus community and wants to start the semester by working with the SGA to get its Public Safety legislation from last semester off the ground and passed through the new SGA senate as a more collaborative bill. Pradhan said she wants to use her future meetings with Stewart to bring up discussion points students of color have been talking about regarding Public Safety and racial bias. She said she feels many African, Latino, Asian and Native American students’ perspectives on campus policing aren’t being heard by Public Safety. “That’s why I picked up [this] bill, because a lot of people in the ALANA community are talking about what they want, and Terri Stewart’s not really responding, and she’s coming to us instead, as if we [the SGA] would have the solution,” Pradhan said. Stewart did discuss an initiative she said has been underway for 18 months and is attempting to create a more conducive relationship between ALANA students and Public Safety. The initiative is part of a four-point diversity, inclusion and engagement plan developed in partnership with representatives from the Office of Human Resources and the Office of Student Engagement and Multicultural Affairs. Stewart said the ALANA student engagement plan was developed with significant input from ALANA students themselves. Stewart added Public Safety is continuing workshops with Human Resources to move the plan forward. Stewart also discussed the college’s Sexual Harassment and Assault Response & Education program with the SGA and resources students have in cases of sexual harassment, assault, stalking and other cases of sexual violence.